It’s official! Race #4 is in the books! April 15, 2016 was the day I ran my first race that I had to fly to. Even though it was a bit overpriced, this was a fun race, and I would do another Disney race. I flew into Orlando on Monday, April 11. My parents live between Disney and Daytona these days, so my mom picked me up at the airport. It also happened to be her birthday when I arrived. Her father died on her birthday 4 years ago, so I know it’s been rough on her. She said that me going there was her best birthday present ever. My dad was away for a few days at an art seminar. So, the day I arrived, I met a couple of my mom’s friends, and we all went out to eat at one of my favorite places to eat down there: Mac’s on Main (which used to be The Main Street Grill). I also went for a run on Tuesday and Wednesday morning so I could get used to running in the Florida weather. I had no idea where I was running, which made it interesting. I ran almost 5 miles on Tuesday and 4 miles on Wednesday. Since the race was going to start at 6:00, and had to be there much earlier than that, I stayed at a motel just outside the Disney parks the night before the race. So, Thursday morning I headed out and went straight to the ESPN Wide World of Sports complex to pick up my packet and goodies. I was pleasantly surprised to find that parking was FREE on this Disney property! Who woulda thought?!? After a short shuttle ride, I arrived at the entrance of the complex. The first stop was Packet Pick-Up. I had a little scare at the pick-up. When I got to the floor, instead of the stations being in alphabetical order, they were in the order of your bib number. The problem is that I had no idea what my bib number was! So I found a volunteer and asked how I know what the hell my bib number was. I had to go to a computer terminal and print out a waiver, and it would have the number there. There were 2 prompts on the screen: Last Name and Date of Birth. So I put my last name and date of birth, and it said my record was not found. I tried all capital letters, all lowercase, and I even put Jr at the end. Nothing! So I told somebody, and they said to go to Runner Relations. The line was HUGE!!!! So, I spent the next hour or so all worried that I came down for nothing. I spent $99 on this race, and there was no trace of my record! Ugh! Oh man, I spent money on airfare, took over a week out of work, and everybody knew I was coming down to run this race. This is all the craziness that was going on in my head! I finally made it to the front of the line, and told them what happened. I had my confirmation email on my phone, all ready to show them. But, they figured it out in about 2 seconds. When I put Jr at the end of my last name, I didn’t put the period! OK, now we’re back in business! 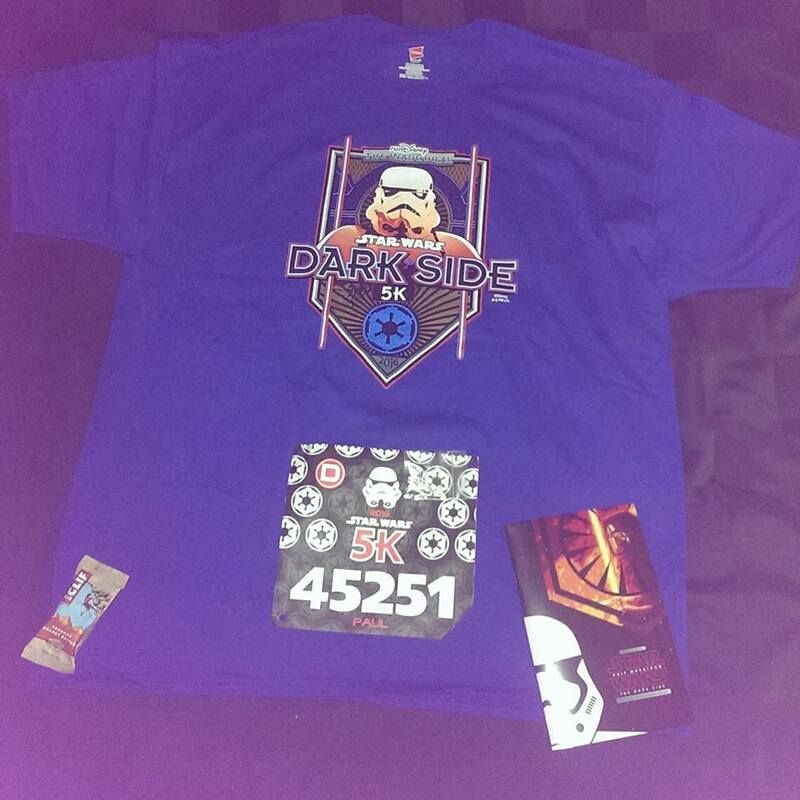 I got my bib number – 45251, so I went and picked up my packet. Then I got my shirt. So, my goodies consisted of an awesome shirt, a little Clif Bar, and an event program, which I already had online. That was just a bit disappointing. We get more stuff from local races at the fraction of the cost of this Disney race. Next, I headed to another building to attend the Expo. There were several booths with over-priced running gear and Disney memorabilia. I’m not a big shopper, so I just glanced at some things in the booths. Then I came across my good friends from Noah’s Light Foundation! I had a great time connecting with them – especially Jennifer, who has been my main contact with that incredible foundation. The next time, I will need to check the picture myself before I walk away! I walked around a bit more, enjoying the atmosphere. Then I left, and went to Downtown Disney, which is now called Disney Springs. One thing of note there is the awesome parking garage there now. You pull into the garage, and each level tells you how many parking spots are available. Then each row displays the number of spots available – and it’s accurate! So cool! Then I headed back to the motel, and stayed in for the night. I was told that I should get to the race by 4:00am. The beginning of the race was kind of boring. We just ran through some of the parking lot, then along a back lot where the employees park. Finally, we made it into the park itself, specifically the World Showcase. I saw a nice view of Spaceship Earth all lit up. So, I went to take a picture of it, and my phone died! I was also using my phone to time my run, since I did not have a timing chip on my bib. So, that went out the window, and I have no idea what my time was. The first mile was around 10:40, which is decent for me now. I was feeling really good. My ankle was feeling better than it ever has since before my injury. There were some spots where you could have your picture taken with a character or scenery. There are all big lines. I didn’t want to stop. The biggest temptation was the mighty Chewbacca. That was the biggest line. Since my phone was dead, I didn’t bother stopping. We then ran through Future World, and by Spaceship Earth. Then it was back out to the parking lot. As we neared the finish line, there was a huge screen which was showing the end of Return of the Jedi when they were about to blow up the Death Star. Between that, and the Star Wars music playing throughout the park, I was really pumped up! I crossed the finish line, and people were giving us medals. I had not been on Star Tours since they refurbished it. The original was pretty good, but I was tired of it. Now it is awesome. There are all different adventures you can go on. My first trip, we went through Naboo. Then I went through Hoth. Then the crowds started coming in. What a great day! I stayed at the motel that night, then went back to my parents’ house the next morning. My dad was back. He painted some great paintings! Since I was with my mom most of the week, she suggested that me and my dad hang out on Sunday while she went out with a friend. We were watching the Tampa Bay Rays baseball game on TV. I asked how far away that field was, and they said a little more than 2 hours. Works for me! We bought tickets for the following day to see the Rays against the Chicago White Sox. Growing up, my dad brought me to see the Pawtucket Red Sox all the time. After the game we would hang outside the locker room, and I would get autographs from the players when they came out. So, we have some great baseball memories. So, I got to see my very first indoor baseball game. The place was nice and clean, and I had a great time. The Rays went on to win the game 3-2. Being a Mets fan, I didn’t really have a horse in the race. So, I rooted for the home team. We sat next to a father and son who were White Sox fans, and wearing White Sox caps and shirts. Everybody was cordial, and there was no beer dumped on the visiting fans. This is the part of the article that I would have just said that I flew back home. But, no! I had quite the eventful day at the airport on the Monday I was coming home. My flight was supposed to leave at 5:35pm, and I was to be landing back in Rhode Island around 8:20. After having lunch with my parents, they dropped me off at the airport. Since I was there at about 3:15 with my luggage all checked in, I had plenty of time. Unfortunately, I had a lot more time than I expected. I looked at my phone and noticed I had an email from Southwest Airlines. At 3:00, they said that my flight was delayed until 8:40! After chatting with my wife with my phone, and going online for a little bit, my phone was dying yet again! I did have some books to read, but I was too tired to concentrate on them. So, I walked around the terminal looking for a place to charge my phone, with no luck. I did get a $100 voucher from Southwest for the inconvenience. While walking around, I thought I saw an old friend who I hadn’t seen in 28 years. I wasn’t sure if it was her or not. Should I go say something? I’ll feel like an idiot if it’s not her. Then I realized that if it wasn’t her, then she will never see me again anyway, so what’s the harm? Here goes nothing. I walked up to her. “Karen?” It took a second, and she recognized me too (even though I’m 100 pounds heavier since we’ve last seen each other, and I now have a goatee). So, I knew it was the right person. She had been in Florida visiting her parents too, and was headed back home to Chicago. It turns out her flight was delayed as well. We found out that we were leaving from the same gate too. I asked her what time she was leaving, and she said 8:45. I said that was a trick since I was leaving at 8:40 from the same gate. Cool, maybe my flight will get delayed again, and I’ll get another voucher! Right on cue, it was announced that her flight was now delayed until 9:50. So, we had a really nice time catching up. And we would never have seen each other if each of our flights were on time. What a crazy universe! And what a great journey so far! You never know what’s going to happen. I’ve made a lot of new friends, and reconnected with an old one. You can’t beat that!